As we were playtesting and demo-ing Specimen around the Midwest, people would ask if we were going to make Specimen into a movie. Never say never, we said, though it’s probably a long way off. But we got to thinking: how would such a movie play out? With so many different possible monsters, which one would we feature? Would the crew survive? How many? Would we follow the tried-and-true “final girl” model of so many horror films and watch Whitaker become the last person standing? We decided that the way to find the answers to those questions was to let the game decide. So we assembled seven of the best Specimen players we know, ranked them and built brackets. We invited some of our cast members to participate, as well as some of our more outstanding playtesters. The last two players’ game would determine the official, canonical sequence of events in the world of Specimen. Whenever possible, we’ve been playing these games at Geek Bar Beta in Chicago. Here are the brackets for the first round, which we played last week. Eric Van Tassell was given a bye in the first round, for no real reason other than an eighth player wasn’t available. The first round is now complete. We had three really good games. Only one of the top seeds advanced. 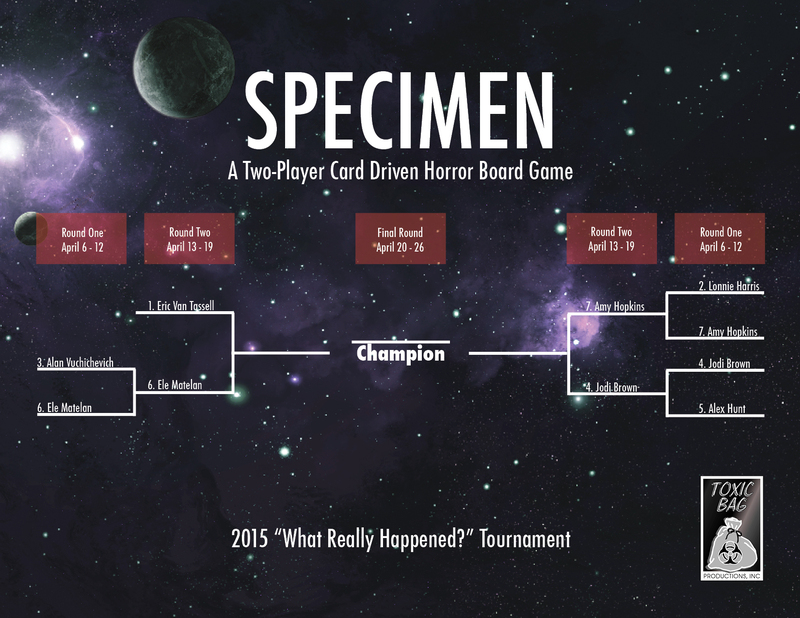 In the first game, Jodi Brown (playing the Specimen) narrowly defeated Alex Hunt. The second game saw Amy Hopkins (playing the Specimen) win on the fifteenth and final turn by blowing up the ship against Lonnie Harris. The last game had Ele Matelan (playing the Crew) defeating Alan Vuchichevich’s collapsible spine Specimen. What do you think will happen? Send your predictions to podcast@toxicbag.com. Posted 4 years ago by toxicbag. Posted 5 years ago by toxicbag.